Kabini SpringsKabini Springs is located within just 500 metres from the Bavali Bus Station and the beautiful Kabini River. It provides 24-hour front desk for the convenience of the guests. Kabini Springs is located 10 km from the scenic Curva Island, 20 km from the famous Wildlife Safari and scared Thirunelli Temple and 30 km from the Manathavady. It is 100 km from the Mysore Railway Station and the Mysore Airport and 280 km from the Kempegowda International Airport. Featuring a balcony with river view, the spacious and bright air-conditioned rooms have a flat-screen satellite TV, sitting area and safety deposit box. They feature a minibar and electric kettle. The attached bathrooms come with free toiletries and a shower. . The guests can utilize the games room and concierge services. The hotel offers valet parking and car rental services. The dry cleaning, ironing service and laundry facilities are available at a surcharge. 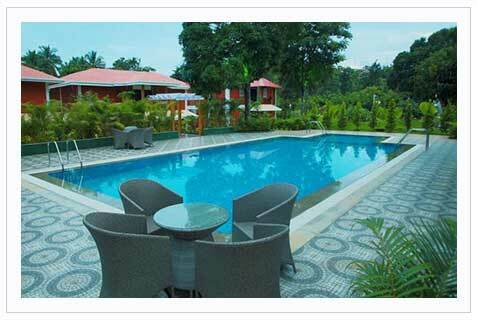 Kabini SpringsRooms & Amenities The resort offers 20 A/C Deluxe Rooms with River view Balcony. Check in 12 noon and check out 11 am. Children below 5 years complimentary. Children above the age of 12 years will be charged full. Same rates are applicable for foreign nationals. Pazhassi Raja was driven to the wilderness of Wayanad, he organized a war, like people's militia with the help of Kurichya tribals and engaged the British in several guerrilla type encounters. Many fierce and internecine encounters took place between the British and Kerala Varma Pazhassi Raja until the Raja committed suicide in 1805 when he was surrounded by the British. This completed the British occupation of Wayanad. The British authorities opened up the plateau for cultivation of tea and other cash crops. Roads were laid across the dangerous slopes of Wayanad, from Kozhikode and Thalassery. These roads were extended to the cities of Mysore and Ooty through Gudalur. Through the roads poured in settlers from all parts of Kerala and the virgin forestlands proved a veritable goldmine with incredible yields of cash crops. Wayanad stayed under British until India gained freedom in1947. When the state of Kerala came into being in 1956, Wayanad was a part of Kannur district; later in 1957 South Wayanad was added to Kozhikode district and North Wayanad remained with Kannur district. In order to fulfill the aspirations of the people of Wayanad for development, north Wayanad and south Wayanad were carved out and joined together to form the present district of Wayanad. Formed as the 12th district of Kerala on the 1st November 1980, Wayanad comprised of three taluks; Vythiry, Mananthavady, and Sulthan Bathery. Tribes of Wayanad : Wayanad offers its visitors a unique opportunity to view the tribal life. The Paniyas, Kurichias, Kurumas and the Kattunaykas are some of the oldest inhabitants of these jungles. Visit one of their villages, taste their food and drinks, watch their art forms, rituals and festivals, and you'll see life - as it was many generations ago.. Vattakkali and Kooliyattam of the Paniyar tribe, Gadhika of Adiyar tribe, Kolkali of the Kurumars and Nellukuthupattu of the Kurichiyas are the major tribal arts in wayanad. The natural scenic beauty of Wayanad and its rich natural resources offer several opportunities for adventure tourism. The hills rocks and valley which make the very unique character of Wayanad provide a lot for catering to the ever increasing demand for adventure tourists. Bangalore - Mysore - H.D.Kote - Bavali Old Manandavadi Road - Antarasante Hobli, Bavali. Total distance 240 kms ( 5 hours).